ProStor Systems, the leader in enterprise-class removable disk storage systems for business backup, archiving, and retention management, today announced the availability of its ProStor InfiniVault® Model 35, a scalable, long-term storage solution that offers an automated data verification capability and more online disk than previous InfiniVault models. Automated data verification checks the integrity of data stored on the InfiniVault RDX® cartridges, then repairs lost data by reconstructing the cartridge. Data verification can be manual or scheduled, and the administrator is notified of cartridge failure. By ensuring the integrity of data stored on the RDX cartridge, this powerful feature offers users a reason to move long-term data retention off of tape, a medium known to suffer from data loss. The InfiniVault Model 35 also offers users a 50 percent performance increase – up to 270 GB/hour — over the Model 30, which it replaces in the InfiniVault lineup. 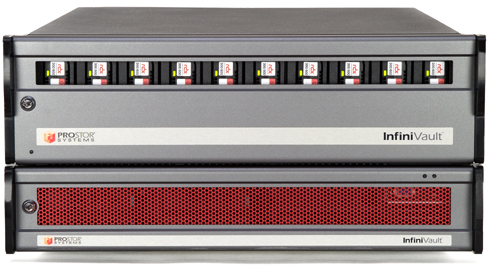 The Model 35 offers 8TB of RAID5 online disk, with support for up to 100 TB of removable RDX disk. The boost in performance and online disk gives users the flexibility to increase the amount of data available for rapid access and retrieval. ProStor InfiniVault® is the only storage system designed to balance the need to cost-effectively manage increasing amounts of information over extended periods of time. A combination of fixed RAID disk and RDX provide complete data protection, continuous data access, security, and retention management throughout the data’s extended lifespan. The Model 35 is ideal for long-term storage and offsite storage for disaster recovery purposes for banking/finance institutions, city and county governments, and digital video archiving.